In the depths of the financial crisis, Goldman Sachs, the world's most influential investment bank, was famously described by Matt Taibbi in Rolling Stone magazine as the "great vampire squid wrapped around the face of humanity, relentlessly jamming its blood funnel into anything that smells like money". In person, however, the boss Lloyd Blankfein did not come across as vampire-squid-in-chief but as a cerebral and often humorous character whose interests in history, art and culture were well matched to his personal financial ability to indulge them. But his legacy - like all bank chief executives at the helm when the ordure hit the fan in 2008 - is determined by the response to the financial crisis. In this regard he has two things going for him. First, he kept his job. Apart from JP Morgan boss Jamie Dimon, the old guard at Citigroup, Bank of America, Morgan Stanley, and of course Lehman Brothers, was swept away by the financial tsunami that crashed over global finance. Second, and perhaps the reason for the first, is that he realised that Goldman's reliance on, and skill at, making money by placing big bets with its own cash would not work in the new financial world order. In the world of so-called "casino banking" Goldman was both a high roller and a pit boss - playing the game while sometimes being privy to the cards of other big gamblers like hedge funds. However, new post-crisis regulations made this a very expensive game to play. Goldman moved fast to change its legal status to the more boring and safer structure of a bank holding company - which requires it to hold more shock-absorbing cash when things go wrong. Goldman is now growing its own retail banking operation - lending money to mere high street mortals rather than just dealing with the masters of the universe - something that would have seemed far-fetched ten years ago. Goldman hasn't had it all its own way in recent years. Morgan Stanley has made inroads and even supplanted it in some of its previous areas of supremacy like trading in shares and pulled ahead of Goldman in market valuation for the first time ever earlier this year. In his own words "When times are tougher, you can't leave. And, when times are better, you don't want to leave." Most commentators would agree with his own assessment that this moment is a pretty good half-way house. 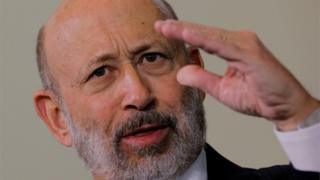 As he heads for the exit it's worth remembering that few people ever really leave Goldman. No other organisation on the planet makes more use of its alumni to continue to wield influence at the highest levels of government. Just ask current US Treasury Secretary Steve Mnuchin (plus predecessors Robert Rubin and former Goldman CEO Hank Paulson), Donald Trump's former strategy chief Steve Bannon and, closer to home, the Governor of the Bank of England, Mark Carney. The vampire squid may have changed in the last ten years but its tentacles are still very long.